Mark the length that you are comfortable to wear as a crop top. Cut a little bit at the sides to make it tighter. Wear it with a fancy pair of bottoms, flip your hair and walk away. Mark a reasonable length till wear you think you are comfortable for the fringes to start. You could also try different designs. Like perhaps zig-zag or diagonal length fringes will be great too. 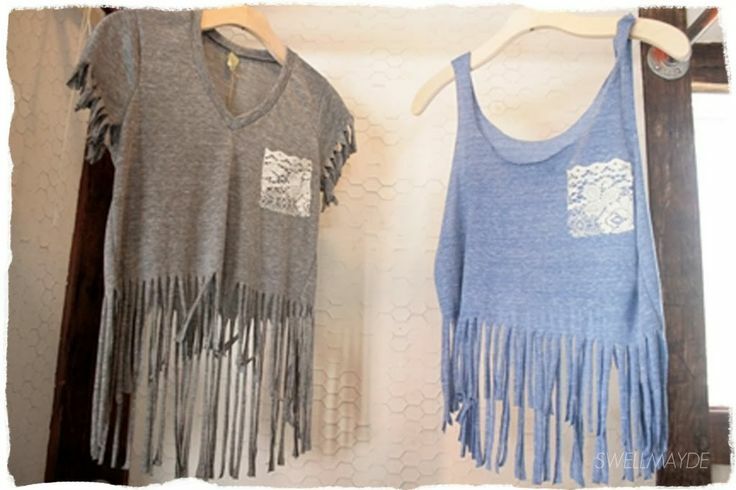 Pull the fringes a bit to make them more fringe-like. What you need here is a non-machine washable dye. Dip the bottom of the shirt in this, for about a minute. Squeeze the excess liquid out of the cloth and then rinse in cold water. Let it dry. When it is still in its damp state, take the powder dye and sprinkle it lightly. 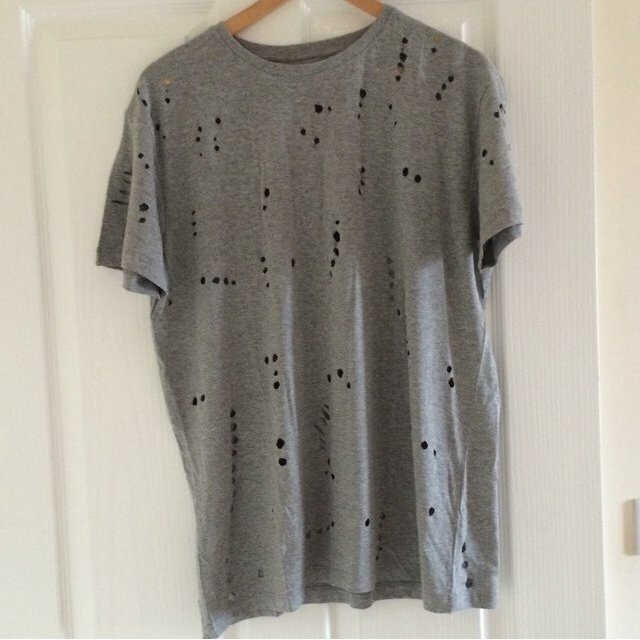 This gives a nice speckled look to the once plain boring tee. Make sure to match the proper dye with proper colour otherwise you’ll kind of have a ruined shirt with mismatched colours by the end of it. After it has completely dry, give it another rinse as a finale. All you need are some nice spray paint cans. To be very honest, you can kind of go freestyle with this according to your mood and aesthetic sense. Or you can use some really cool stencils (which you can prepare by yourself by the way) and spray paint through them. 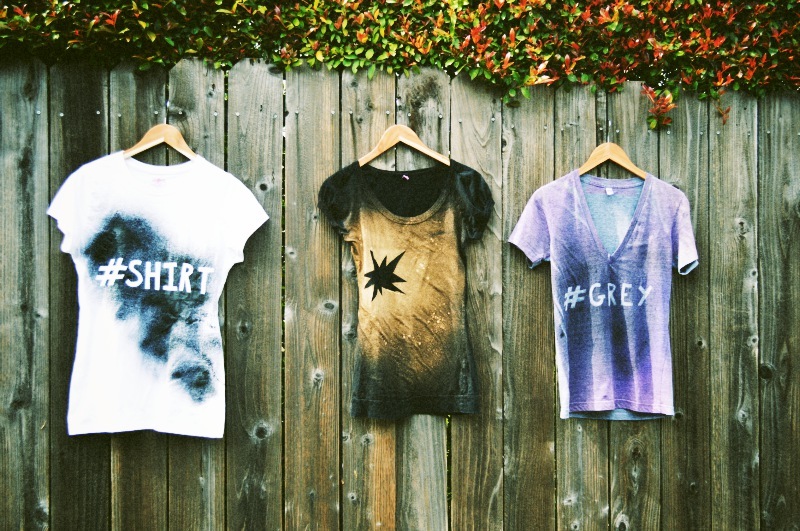 You can also have a spray paint battle with your friends and end up with a really cool shirt by the end of it. Just make sure that you don’t wear the shirt right away, because spray paints kind of smell awful. Wait a day or two, rinse it and then you are good to go. Our dear friend scissors are back again. A nice stretchy top would be nice to carry this out. Take a pinch of cloth in your hand and snip it. What you need to be careful of here is that you don’t need a large gaping hole so the idea is to snip bare minimum sized hole as possible. And just go crazy. They needn’t be symmetrical or anything so don’t worry if the holes aren’t of the same size. You can repeat it on the other side of the top too. With a cool top underneath, you now have a brand new holed top to wear upon it. Take a shirt and snip of the sleeves (or better, choose a sleeveless shirt) and the collar to make it wider and deeper near the neck. Cut it along the sides completely till sleeves. Then take the ends of the sides and tie a knot so that now your top is revamped with a hole through it. Repeat it on the other side as well. This shirt gives a sporty vibe and looks great when paired with a cool inner top and some sneakers.